Alexander Frolov scored his first NHL goal at Madison Square Garden and ranked MSG as his favorite NHL arena in last year's Kings media guide. New York Rangers President and General Manager Glen Sather announced today that the club has agreed to terms with unrestricted free agent forward Alexander Frolov. Frolov has surpassed the 20-goal plateau in five of his seven NHL campaigns, including two 30-goal seasons in 2006-07 and 2008-09. Frolov, 28, has skated in 536 career regular season contests with the Los Angeles Kings, registering 168 goals and 213 assists for 381 points, along with 210 penalty minutes. He has recorded 24 multi-goal games in his career, including three career hat-tricks. In 2006-07, Frolov established career-highs in games played (82), goals (35), assists (36) and points (71). He led the Kings in goals and game-winning goals (six) that season, and finished second on the team in points. He was one of only two players on the roster that appeared in all 82 games, and tied for third on the team in shots on goal (195). In 2008-09, Frolov led the team in goals (32) and power play goals (12) while finishing second on the team in points (59) and power play points (25). It marked the third time in his career that he led the Kings in goals, having previously led his team in goals in 2003-04 and 2006-07. Frolov also led the Kings and ranked sixth in the NHL with an 18.2 shooting percentage. He registered 14 multi-point efforts, leading Los Angeles to an 11-1-2 record in those contests. On January 21, 2009, Frolov tallied two goals at Colorado, including his 20th of the season to become the first Kings player to record at least 20 goals in five straight seasons since Luc Robitaille registered eight consecutive 20-goal seasons from 1986-87 to 1993-94. Frolov finished the season strong, tallying 30 points (14 goals and 16 assists) in his final 32 games. Alexander Frolov won a silver medal with Russia at the 2010 World Championships in Germany, where Rangers center Artem Anisimov was his teammate. As a rookie in 2002-03, Frolov tied for third in the league among first-year players in plus-minus rating (plus-12) and ranked fourth in shots on goal (141). He made his NHL debut on October 9, 2002 vs. Phoenix, and tallied his first career point with an assist on October 19, 2002 vs. Vancouver. He notched his first career goal at MSG on October 25, 2002 vs. the Rangers. The 6-2, 210-pounder appeared in 81 games with Los Angeles last season, registering 19 goals and 32 assists for 51 points, along with 26 penalty minutes. Frolov registered two, four-game point streaks during the month of October – from October 3 vs. Phoenix to October 10 at St. Louis (one goal and three assists), and October 22 vs. Dallas to October 28 at San Jose (three goals and four assists) -– and finished the season’s opening month with 12 points (four goals and eight assists) in 13 games. He registered 10 multi-point performances, including a season-high, four-point effort on March 8 vs. Columbus (one goal and three assists). The seven-year veteran appeared in his 500th career NHL game vs. St. Louis on January 9. Internationally, Frolov has represented Russia in several major tournaments. Most recently, he captured the Silver Medal with his native country at the 2010 World Championships. In 2006, he made his Olympic debut for Russia at the Winter Olympics in Torino, Italy. 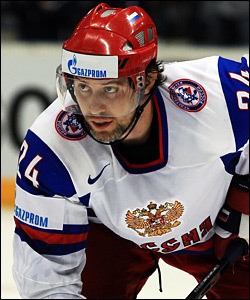 Frolov also won a Gold Medal with Russia at the 2002 World Junior Championships in the Czech Republic. He led the team and ranked second among all tournament skaters with six goals, and tied for the team lead and third overall with eight points. The Moscow, Russia native was originally Los Angeles’ first round choice, 20th overall, in the 2000 NHL Entry Draft.